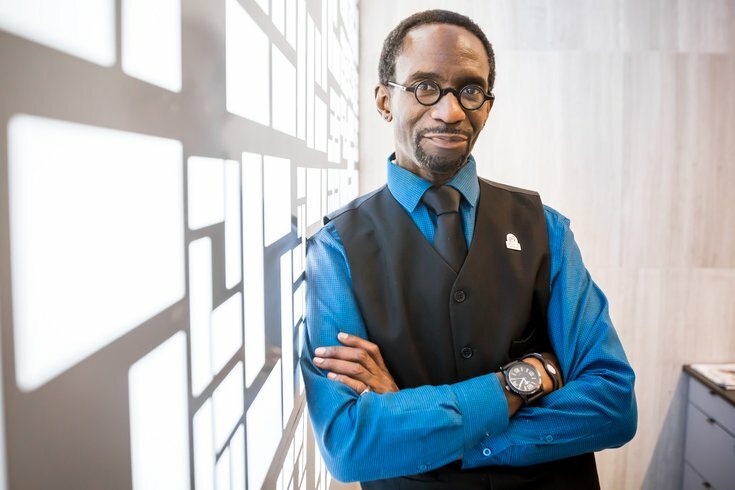 Oleg Cassini McKune, front desk concierge, security and self-proclaimed multitasker at the Avenir apartment building at 42 S. 15th St. in Center City. “I just want to make a small difference," he says of his ability to delight both tenants and passersby. The card was a simple gesture of gratitude inspired by countless gestures of positivity. “Dear Mister,” read the note from a woman who was walking along South 15th Street near Chestnut on the last day of her part-time job in Center City. “Although I don’t know you, your example of kindness and attention to all of us passing by has been such a bright encouragement. Opening that card – and seeing the blue “You are my inspiration” pin – brought a huge smile to Oleg Cassini McKune’s face in early December. That expression mirrored the smiles that the 54-year-old father of six (five daughters and a son ranging in age from 19 to upper 30s) brings to the faces of many people as they walk past the Avenir on Fifteenth on any given weekday. McKune is the doorman/concierge of that apartment building. Every weekday – from around 7 a.m. till about 3 p.m. – he stands in the doorway greeting both tenants and passersby. Those are just a sampling of the positive greetings he shares. Despite a swirling aura of negativity outside, just about everybody responds with kind words of their own, a smile, a fist bump, an offer to grab him a coffee or, in the case of passing SEPTA buses, a honk of the horn. It applies to this insofar as simply offering kind words and gestures make McKune stand out amid the hustle-and-bustle of the city. He’s not in it for the attention, but his positivity has prompted a stranger whose neckwear he complimented to send a box of ties as a gift. There’s been fruit baskets, cards containing cash and other tokens of gratitude sent McKune’s way in the year that he’s worked there. He’s the type of doorman who has never used the unlock button under the front desk; he prefers to get up and let tenants in and out personally. He’s the type of employee who makes sure tenants don’t complain about others who don’t behave in the same fashion; he reminds them that all people are different and that his peers do a great job, too. He’s the type of man who, instead of pocketing the $20 that someone handed him in a greeting card, spends it on the less fortunate who need a coffee or some food from the Dunkin Donuts location around the corner. He is, quite simply, a decent human being worthy of recognition for doing the small things that make the world a friendlier place. When he’s not outside the door on a given workday, he’ll hear about it from the legion of passersby – teenagers, college students, professionals, detectives, construction workers – the next day. “I just want to make a small difference," McKune responded when asked why he does what he doesn’t necessarily have to do. Making that difference has manifested itself in building bridges with students from a nearby charter high school who, last year, found themselves getting in trouble when school let out for the day. He estimated that about 95 percent of the people acknowledge his sentiments. But what about those five percent? He lauded McKune’s attention to detail and said his “outreach to the community” makes him part of the building itself. He doesn’t see such an approach at other buildings he’s managed. As he was sharing those sentiments, McKune was busy making sure the laundry got out to the dry cleaner who had showed up. He knows there are probably others out there in his position who greet people with similar cordiality. Still, there’s certainly a unique feeling to what McKune does, particularly on Monday morning, when many passersby were down in the dumps as they awaited word about the severity of the injury to Eagles quarterback Carson Wentz. If ever there was a day when the untold numbers of people with whom he randomly connects needed that extra moment of kindness, this was it. Tis the season to celebrate positivity. Do you know of an unsung hero who brightens Philadelphians days like McKune does? Let us know via email so we can catch up with them as well.